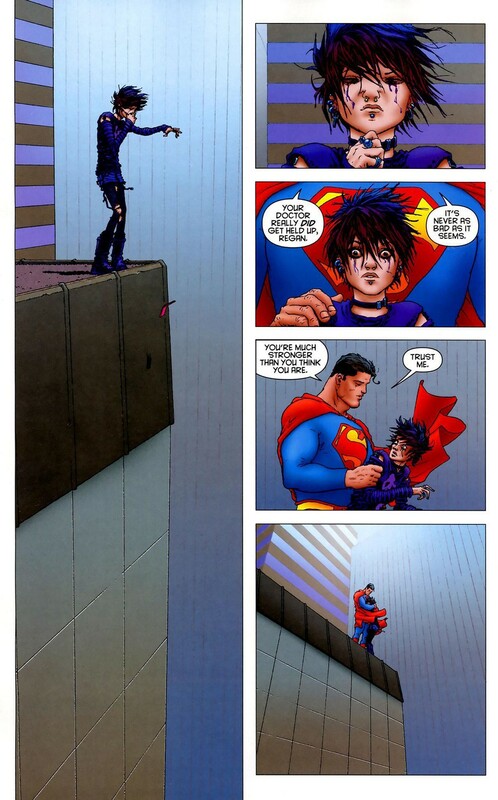 It’s a great moment that epitomizes what’s so “super” about Superman. Obviously, he can’t cure everything that is going on in the young girl’s head and all her problems, but to be there in that moment and show her that someone cares? That’s pretty damn cool. “You’re stronger than you think you are.” Indeed. That’s a mantra I even repeat to myself sometimes to get through difficult patches. To expand upon that a bit, I’ve always struggled with how to articulate why exactly I like Superman. Maybe I’ve found it embedded in this short, but potent comic panel. But first, ignore the side chatter, I don’t care that Superman is a “fictional” character. Why is it so wrong to want to draw on fictional characters for inspiration, hope or to serve as a role model of sorts? For one, they come from the minds of other humans, so by extension, there’s that connection and two, fiction is the window into the human condition. Why shut that window and be dismissive because it’s “fiction?” My point is, just because Superman does not exist does not mean he cannot still engender a sense of optimism in someone. I’m not sure what the statistics are or how prevalent it is among people in society whether they’re clinically diagnosed with depression or just have the fleeting moments of depression that everyone faces, but I wonder how often someone considers suicide and to what degree. I like to consider myself rather introspective, so I think a lot about a lot. And within that, I think about death and what it would be like to “be dead.” Not the actual act of “being dead,” but what it would mean for those that knew me and my “legacy” if you will. I don’t mean that in a pompous way; just a curiosity. How many people would care? Who would care the most? Who would it surprise me to find out (if that were possible) that they cared? Who wouldn’t care or wouldn’t care all that much? Thoughts like that permeate my head from time to time. And sometimes, yeah, if I’m in a particularly dark place such will translate to, “I wonder what it would be like to kill myself? Could I do it and who would care?” As a would-be writer, I often spend most time contemplating what my “suicide letter” would be, even though most suicides do not leave behind anything giving indication as to why the suicide happened. Of course, those thoughts are fleeting and not credible. I chalk up some of that to being introspective and thinking about everything and yes, some of it is just being in a dark place at the time of the thought. I don’t know how normal it is to think about it, but don’t confuse me. I’m not a cynical or pessimistic person. I am the majority of the time quite optimistic, cheerful, and laid back and the sort; I just have my moments, I guess. Getting back to the point, however, I don’t think Superman’s going to solve suicide, but at that moment, he was there for that girl. And sometimes, maybe, people in real life need their own “Superman” to be there in that moment, whoever that “Superman” represents: a brother, a father, a daughter, a friend, a teacher, a police officer; whatever the case may be. wow. this is amazing. After I read this, I found out that remembrance of this comic strip has been effective therapy for people struggling with depression. nice article, I re-posted the comic on my victims blog. I appreciate that, thank you!